The Air Balancers achieve high performance, excellent safety, and low cost in the handling of heavy materials. Effortlessly handle materials in a three dimensional work space. The push-button hand control operates the pneumatic cylinder, raising and lowering the cable, in turn, positioning the load. Arm rotation is 360 degrees. Air pressure 100 psi. 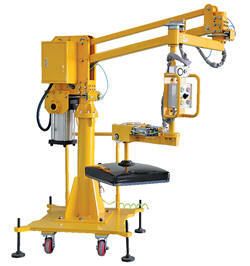 Pneumatic Vacuum Lifter is designed to lift products with smooth, fl at and non-porous surfaces. Push button to operate vacuum to grab product. Release button to release product. 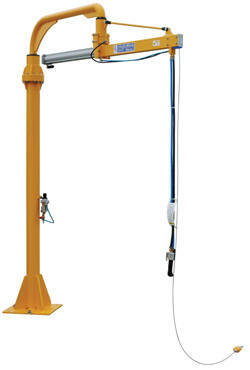 Positioning of product is provided by the Air Balance Jib Lifter. Double Hook Lifter is designed to lift virtually any type of object, either small or large, long or short, round or fl at. Simple double-hook design with mechanical operation only. Positioning of product is provided by the Hoist.